The “Black Widow” pulsar is moving through the galaxy at a speed of almost a million kilometers per hour. A bow shock wave due to this motion is visible to optical telescopes, shown in this image as the greenish crescent shape. 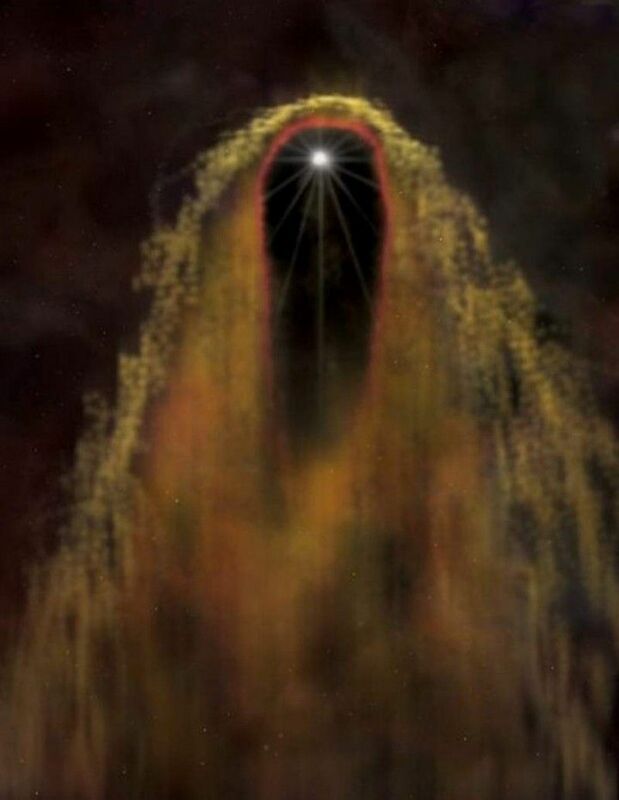 The pressure behind the bow shock creates a second shock wave that sweeps the cloud of high-energy particles back from the pulsar to form the cocoon. This composite X-ray (red/white) and optical (green/blue) image reveals an elongated cloud, or cocoon, of high-energy particles flowing behind the rapidly rotating pulsar, B1957+20 (white point-like source). The pulsar is emitting intense high-energy radiation that appears to be destroying a companion star through evaporation. It is one of a class of extremely rapid rotating neutron stars called millisecond pulsars. Calculations suggest that the “black widow” will evaporate away its companion in about a billion years. These objects are thought to be very old neutron stars that have been spun up to rapid rotation rates with millisecond periods by pulling material off their companions. The advanced age, very rapid rotation rate, and relatively low magnetic field of millisecond pulsars put them in a separate class from young pulsars, such as the Crab Nebula. Pulsars rank at or near the top of freaky phenomena found in our Universe. In the early 1930s, California Institute of Technology astrophysicist, Fred Zwicky, an immigrant from Bulgaria, focused his attention on a question that had long troubled astronomers: the appearance of random, unexplained points of light, new stars. It occurred to Zwicky that if a star collapsed to the sort of density found in the core of atoms, the result would be an unimaginably compacted core: atoms would be crushed together with their electrons squeezed into the nucleus, forming neutrons and a neutron star, with a core so dense that a single spoonful would weigh 200 billion pounds. But there’s more, Zwicky concluded: with the collapse of the star there would be huge amounts of leftover energy that would result in a massive explosion, the biggest in the known universe that we called today supernovas. Most neutron stars house incredibly large magnetic fields. If they are spinning rapidly they make fabulous clocks, cosmic radio beacons we call pulsars. Pulsars can keep time to an accuracy better that one microsecond per year. Some pulsars generate more than 1000 pulses per second, which means, as Lawrence Krauss wrote in The Physics of Star Trek, that an object with the mass of the Sun packed into an object 10 to 20 kilometers across is rotating over 1000 times per second, or more that half the speed of light!